I got 43 up votes! And 79% of the world thinks I'm funny. At least, that's what I've decided that's telling me. Reddit gave me some karma points (21) for getting upvotes. I don't think karma points get me anything, the points are just a medal to wear for bragging rights. Kinda like the Purple Heart. But in our video game world, we love measurements of our accomplishments, so of course I'm giddy to be on the map. The bottom line is, I posted something to the internet and 54 strangers received it. And they didn't hate it, which is already a leg up from my first post! In doing this, I saw the spark of the Internet ignite briefly. If my post was more witty/unique/honest/insightful, there were 54 people that it could have reached. And if even one of them like it enough to share it, that's the next step to reaching Internirvana Netvana Internet Nirvana (#portmanteauFail). I believe that my 2nd Reddit post made it to step 2 before sputtering and dying. But that means it was on its way. The good posts stand on the backs of the bad posts to rise to greatness. A tad dramatic? Sorry. 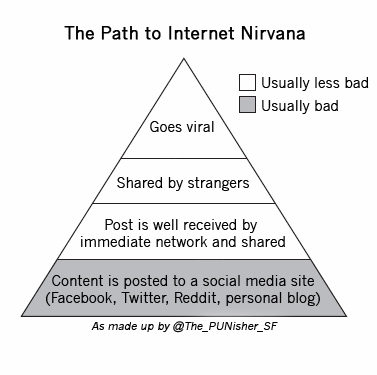 On this silly educational journey that I'm taking, it seems like my goal should be to at least reach the 3rd step on the Nirvana pyramid. Obviously, to study the full effects of social media and modern day communication, I should aspire to Internet Nirvana, but I think we all know you can't just "decide" what goes viral. Most of the videos that succeeded would have been shamed into submission if anyone suggested such absurdity. My goal is to know the process, and anything that gets me closer will be a win in my book. On that note, maybe I should post my Nirvana chart on Reddit for someone to appreciate. And...if they reward me with more karma points, I could move closer to Internet Nirvana. Geez Reddit, it's like they planned it this way. Very good post, your post is very useful. Showcasing to similar individuals again and again won't broaden your degree and social reach. All utilization a framework called HIS. HIS is a (healing facility data framework). HIS is programming utilized by all doctor's facilities and incorporates the majority of their specializations.